Sometimes it really does all come down to location. 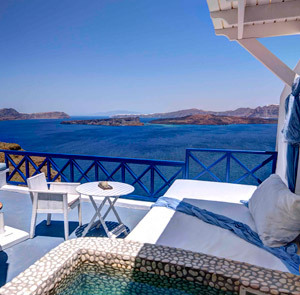 Trends in travel come and go, but Greece’s volcanic islands have been a hot destination for just about as long as humans have had the ability to move from place to place — there’s something about balmy climes, dramatic rocky vistas, and deep azure seas that never goes out of style. It would take a peculiar sort of anti-talent for hospitality to manage to create a bad hotel in this sort of environment — which is not to say it hasn’t been done many times over. And conversely a well-done hotel, in these surroundings, results in an experience that’s pretty near spectacular. Small is key, and Astarte is certainly that; nine suites is about the dividing line between small hotel and large guest house, where intimate hasn’t yet crossed over into solitary. A steep staircase shepherds guests down the hillside from the road, and provides a bit of extra incentive to stay put. Inside they’re impressive, all with views of the volcano and the caldera, with some well-chosen luxuries like jacuzzis with Swarovski crystals overhead. Services and facilities, similarly, are minimal but well-executed: an infinity pool with a view that reminds you what the point of infinity pools is, a cafe and lounge (also with a view), and shuttle service to the airport or the coast. 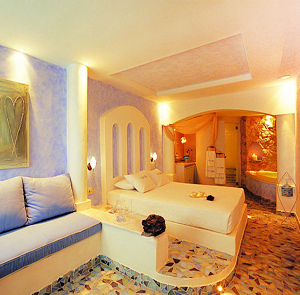 Just a comfortable room, and nothing to spoil the scenery; around here, there’s no need to ask for anything more. 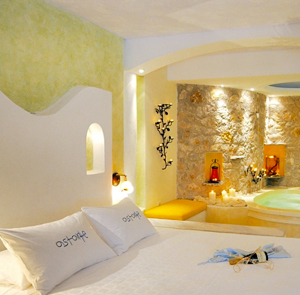 Please note: Astarte Suites is open seasonally from April through October. Children under 13 years of age are not permitted at the hotel. Santorini (Thira) can be easily reached by plane or ferry. Flight time from Athens is approximately 45 minutes. Ferries from Athens' Pireaus port to Thira take approximately 3 hours. Please contact CustomerService@TabletHotels.com for assistance with transfers to the hotel.